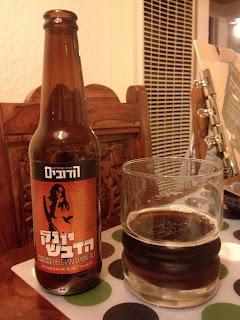 I'm really glad that RateBeer has these Israeli mega-recon beer names translated into English characters, because I'm fairly certain if I tried to translate it from Hebrew myself with Google I'd end up titling a post "Bears Frantic BackSweat Racism Ale" or something. This one's a little more poetic than that- Hummingbird, according to Ronen (Google says Sunbird). Anyway, the label depicts what appears to be a naked woman with a hummingbird poised to drink from her apparently deliciously pollen-filled elbow. It says on the bottle that this tastes like cloves. By the smell, they ain't kidding- it smells like clove puree. There's a lot of nice fruitiness, as well as plenty of root-beeriness, which I like a lot. There's a touch of cardboard must in there- not like a bad amber ale because there's a lot of other things to mask it, but it's there. The flavor's not nearly as rich as the smell, which could be a good or a bad thing based on your personal preference. The bitterness is surprisingly strong because it didn't really show up in the smell. There's still decent root-beeriness...actually, I'd call that the strongest flavor. The Belgian-yeasty fruitiness is pretty muted. It's got a light body for a Belgian dark, but the bitterness makes it a fair bit less drinkable than, say, Trois Pistoles. Not bad at all. It served very well as a bit of light stretching before a bout with Decadence. Based on this and HaDoctor, I'd say the folks at HaDubim have some skills. Got me all excited with that BackSweat Ale. Yum, y'all!